The EFMC/ISMC 2012 sunset session organized by the EFMC Industrial Liaison Committee centred on “How the Industrial/Academic Interface is Changing Medicinal Chemistry”. The Chair of this session (Dr. Alan Brown, Head of Medicinal Chemistry at PFIZER NEUSENTIS, UK) opened with a thoughtful overview of why MedChem must change. He highlighted the decreasing numbers of FDA-approved NMEs over recent years along with the increasing amount of R&D spend. He stressed that increasing the collaboration between industry and academia, and aligning their scientific direction, will be key in driving a much needed boost in productivity. Dr. Torsten Hoffman (Head of Medicinal Chemistry at F. HOFFMANN-LA ROCHE, Basel) gave a fascinating insight into how scientists at Roche are working with academia to foster innovation. An example of this is the Roche Innovation Council that funds scientific ideas from Roche scientists. A recent success story from this endeavour is the synthesis and physicochemical characterisation of a number of oxetane, spirooxetane and bisazetidine containing compounds. This work was done in partnership with the Carreira lab, and the interesting MedChem properties of these motifs have generated significant interest in the wider pharmaceutical community. Evidence of this is through the huge increase in patents and publications containing such structures and their recent addition to a number of fine chemical catalogues. A start-up company called SpiroChem also evolved. Another example of Roche leveraging external innovation is through their Collaborative Model scheme in which Roche provides a 100K library of diverse compounds for use at academic centres involved in new target research. Dr. Hoffman stressed the importance of being scientifically innovative in a risk adverse world where funding is ever harder to secure. Dr. Paul Brennan (UNIVERSITY OF OXFORD, Oxford) gave an interesting overview of work conducted at the SGC (Structural Genomics Consortium). The SGC is a public-private partnership whose mandate is to promote drug discovery by placing protein structures of relevance to human health into the public domain with no restrictions on their use. A major focus for the SGC is the generation of epigenetic chemical probes and fit-for-purpose molecules to test novel mechanisms in in vitro systems. This work is done in collaboration with big pharma companies and an extensive academic network in which no IP is generated. To-date, a large number of crystal structures have been solved and a range of small molecules delivered that are active against a number of interesting epigenetic targets. Dr. Brennan argued that whilst this collaborative target ID/hit generation model is effective, we should look to extend it to the pre-completive generation of clinical data that validates the target, as most novel targets fail in the first patient study. TRPV1 is a case in point with 29 organizations having been active in an area that ultimately failed to deliver, clearly an unsustainable model. Dr Giovanna Zinzalla (KAROLINSKA INSTITUTET, Sweden) stated the importance of chemical biology and academic research in delivering novel therapeutics. She highlighted that academic research has given rise to 9.3% of all drugs and that 90% of all drugs against new indications have had an academic origin. Dr. Zinzalla stated that chemical biology has come to the fore as a method of understanding how biological systems operate and how they can be manipulated. Chemical biology, she said, has enjoyed a “decade of discoveries” and these have mainly come from academic labs. It is therefore vital that pharma and academia work together to characterise novel targets that may be therapeutically valuable. She noted that academic research, to be truly innovative and complement the drug discovery process in pharma, should focus on targets for which there is no direct preclinical data linking them to a disease, or tackle the more challenging so called “undruggable” targets. A key area of Dr Zinzalla’s research is the targeting of protein-protein interactions (PPIs), for which Ro5/classical small-molecule libraries are often inadequate. She showed an example of peptidomimetic design to deliver Hydrogen Bond Surrogate α-helices on the c-MYC transcription factor project. The talks were followed by a round-table discussion with the speakers and the chair. Members of the audience were keen to hear how a pre-competitive research model could work moving forwards. The panel discussed whether the need to publish versus the need to retain Intellectual Property hinders the partnership between academia and industry at present. The panel questioned whether the tendency of Pharma to hold back on disclosure of ground-breaking approaches and science was detrimental to itself, academia and, ultimately, the drug discovery process in the long run. A discussion of academic drug discovery and whether it was too fragmented with respect to expertise and facilities also took place, and how better communication between groups within academia as well as with Pharma would be key to driving successful projects forward. The panel felt the future was bright for collaborative-based research and that any hurdles, perceived or otherwise, are certainly not insurmountable. Members of the audience also expressed a feeling that synthetic chemistry is not involved enough in the early drug discovery process and that we (the chemists) need to talk more with our biology counterparts and be part of the discussion. It was recognised we want to get to a world where chemists and biologists work together at the early stages of target discovery so we have the opportunity to deliver chemical biology probes/compounds that will help transform our understanding of biological pathways. The innovative use of chemical probes/molecules in the biology arena and increased discussion with industry leaders, grant funding bodies and government should bring synthetic chemistry back into a central focus. In addition, the presentation to the recipients of the 1st European Federation of Medicinal Chemistry – Roche Studentship for excellence in Medicinal Chemistry during an Industrial Trainee placement was made by Ulrich Stilz (EFMC President) and Torsten Hoffmann (Roche). 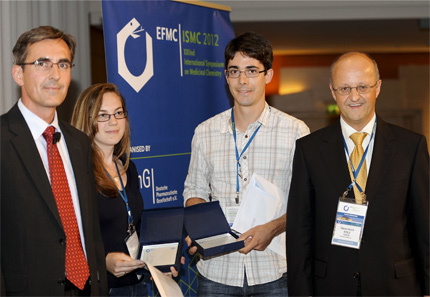 The prize winners were Nicole Trainor (Imperial College, UK) and Claudio Grünenfelder (ETH Zürich, Switzerland). The Industry Liaison Committee on behalf of the EFMC would like to congratulate Nicole and Claudio on their fantastic achievement. The EFMC-ILC hope that other pharma companies supporting medicinal chemistry internship students can recognise excellence in this way. Gerhard F. Ecker Past Pres.